Financial Proposals & Avoiding Bankruptcy - Take Financial Control of Your Life! Are you constantly struggling to keep up payments on your debt? Are you feeling that your life is being controlled by your creditors? There are THREE STEPS necessary to break out and regain your financial control. STEP ONE is to acknowledge that the problem exists and recognize that, if you don't take action soon, things will only get worse. STEP TWO is getting information. 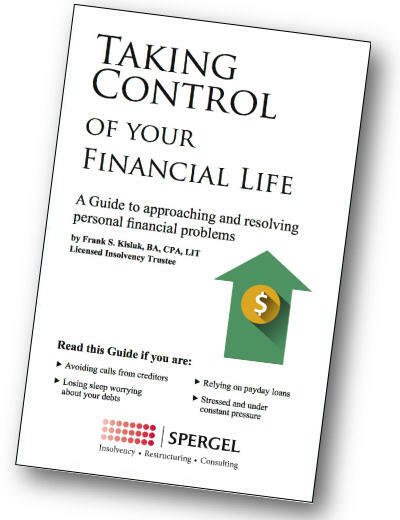 Download and read our free guide "Taking Control of Your Financial Life". The more information you have about your rights, and those of your creditors, the easier it will be to sort out real concerns from those that are imagined. This information will also help you to understand the options that are available to you. Yes! You do have options and this Guide will explain them! Once you are able to separate fact from fiction, once you understand the choices available, you can then make an informed decision and take control of your financial life. Remember - you can take control and you do have options. and stop stressing over your financial situation. Download your FREE copy of "Taking Control of Your Financial Life" right here!